Buying a cubicle can be one of the easier things in your office to purchase if you have your ducks in a row and know where to look. Here are a few steps and tips on buying your first cubicles. 1. Know your budget. Most companies today prefer to save money. Wink, Wink. This, therfore explains why more and more companies are looking to used or pre-owned cubicles as a viable option. New cubicles can range from $1,500 all the way up to $10,000 EACH! Thats a stiff price. Used cubicles can range from $200 to about $1,200 for high end product. Now you see why so many businesses buy used cubicles. The savings are just too great. Also, be sure to leave room for shipping costs for your furniture. No office furniture dealers will state what the cost of shipping is per cubicle because its too difficult to know off hand. It helps if you look for cubicles in your area, obviously, the closer the furniture is to you the less the shipping will be. 2. Know your employees. In other words know what type of person is going to be sitting in the cubicle? What do they do all day? Do they require a lot of storage? Do they require a lot of filing space? Just some things to think about. We have noticed the cubicle getting smaller and smaller over the years, which is unfortunate. In general, the larger the cubicle the happier the employee. If your employees are telemarketers buy call center stations. If your employees require a little more privacy a popular size is a 6X6 cubicle. Top sizes for managerial cubicles are 8X8 and 8X10. Back in the old days an 8X8 was standard issue to everyone in the company. 3. Have your floor plan. Very important: have a DWG or at least a PDF file of the floor plan of your office space. This will expedite your office furniture purchase and help your office furniture dealer draw the furniture into your space to ensure it will fit. This will also dictate how many cubicles you can fit into the space, allow to make preparations for fire code and allow you to choose the layout of the furniture. 4. Have an electrician ready. Most office furniture buyers don’t realize that you have to hire an electrician to hook up your cubicles electrical. It is always a good idea to obtain several bids on your office furniture electrical needs. Your electrician will want to see the furniture drawn into the space which was outlined in step 3 above. He needs this information so he knows where the base feeds or (power cords) will attach to the wall or ceiling. Electricians typically come into the space while the furniture is being installed to make the connections. 5. Have a data provider and installer. Data is obviously essential in todays workplace. This situation is very similar to the electrician. He will need drawings of the furniture, this is so he knows how many miles of wire to pull and to bid for. he too will be there on installation day. 6. Storage options. Choosing the correct amount of storage is not difficult at all however, the more storage you have in each cubicle the higher the price. I always tell people, when in doubt get more storage. You never hear anyone say ” man I just have too much storage”. Typically each cubicle will have one box box file and one over head storage bin. If your employees require more storage than that you could go with a lateral file and an over head storage bin. The options for starge are limitless. 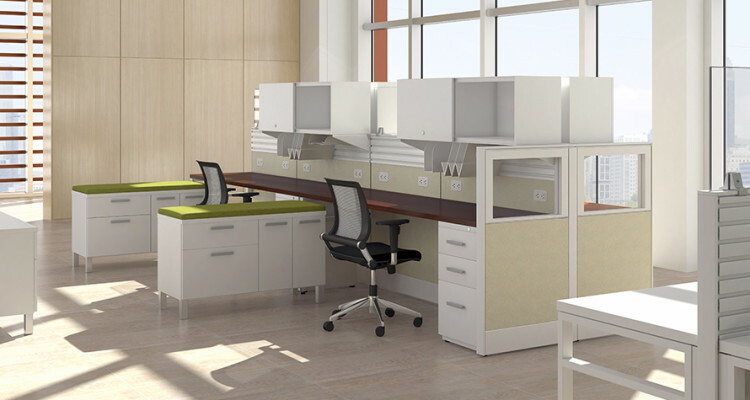 You wil find that most used cubicles come with an adequate amount of storage. Quick note…shelves are a thing of the past. We rarely see cubicles with shelves. If choosing between a shelf and a overhead storage bin, pay the extra money for the overhead storage bin. They are lockable and hide clutter. 7. Extras. If I were buying my office cubicles I would tack on a few extra items that spruce up the look and feel. Here are a few items you can think about. Keyboard trays, marker boards, glass tiles, above work surface power, lateral files, mobile pedestals, drop down wing panels, up lighting ( very cool). No Comments on "Cubicle Buyers Guide"